More than 1,800 schools in 290 school districts took the statewide ISTEP+ exam this year. You can find your school’s scores here. Yesterday we published the annual ISTEP+ results, with data courtesy of the Indiana Department of Education…but what does it all mean? 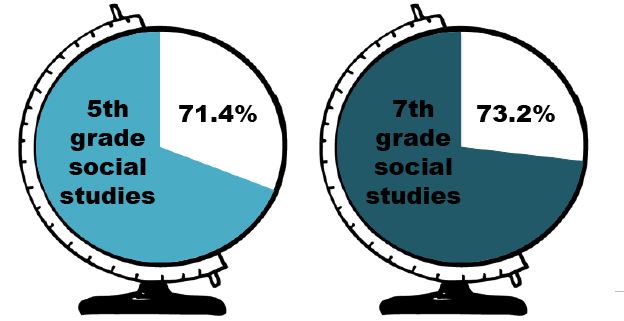 Statewide, 74.7 percent of students passed both the English/Language arts (ELA) and math portions of this year’s test, according to IDOE data. If you check out the green bars in the chart below, you’ll see that the amount of Hoosier students passing both sections has steadily increased over the last four or five years. This year’s gain was the smallest, climbing by only one percentage point from 2013. Take a look at that chart again – the reason the combined score has been going up is because students are making similar gains in each of the individual English and Math portions. Preliminary reading scores statewide saw a solid 1.2 percentage point gain over last year to reach 80.7 percent passing. Students also gained a half point in math last year, moving that number up to 83.5 percent passing. 3) What About Other Subjects? Don’t forget, students in certain grades take other subject tests as part of ISTEP+ as well. Fourth and sixth grade teachers administer a science test to their students, and kids in fifth and seventh grades are quizzed on their social studies knowledge. 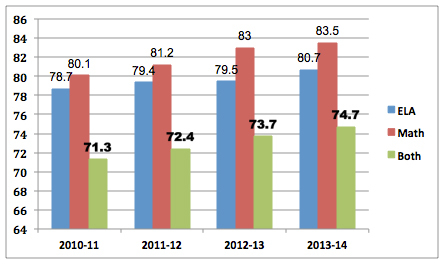 Science scores had a total average passing rate of 71.9 percent, up 1.1 percentage points from last year. 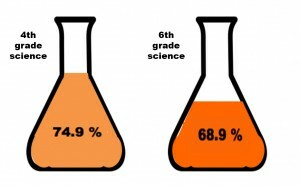 As you can see on the left, 74.9 percent of fourth graders (left) and 68.9 percent of sixth graders (right) passed this year. 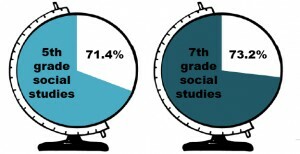 As for social studies, the total average passing rate this year came in at 72.4 percent — 0.3 point more than last year. 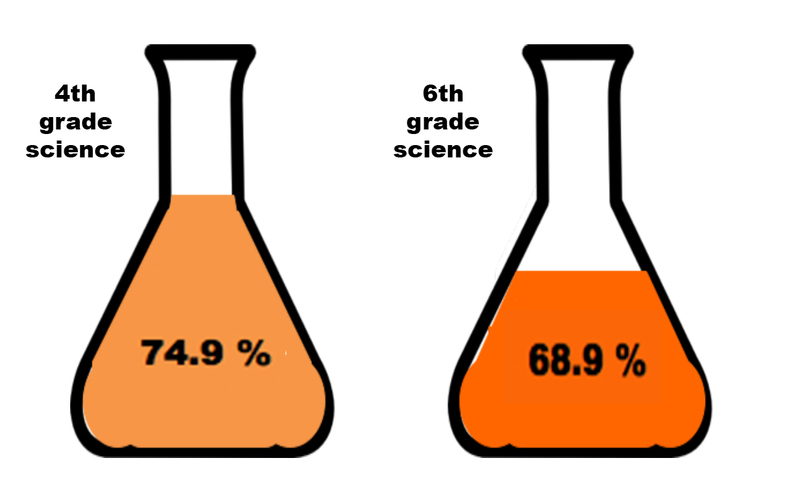 Fifth graders passed at a rate of 71.4 percent (left) and seventh graders at 73.2 percent (right). Non-public school scores tended to be slightly higher than those at public schools — which has been a common trend over the last four years. 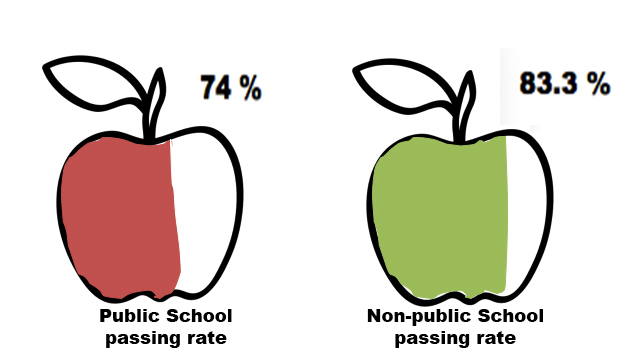 Public schools’ passed both ELA and math at a rate of 74 percent (left), up a full percentage point from last year, whereas non-public schools’ rate was closer to 83 percent (right), up 0.2 points. 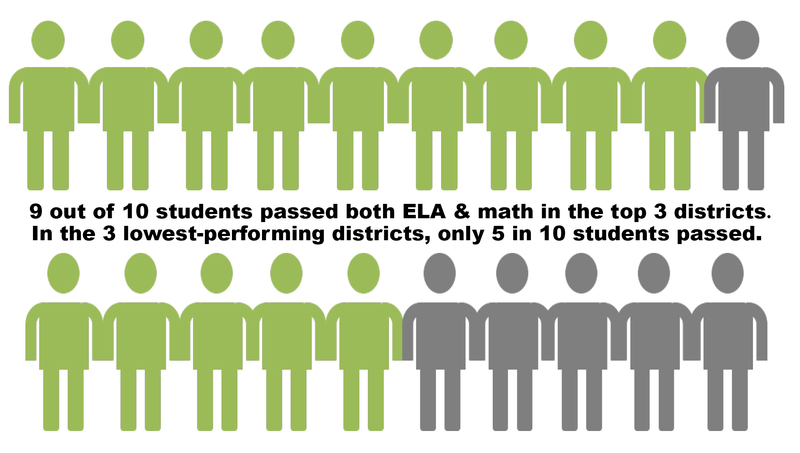 On the ELA portion, 80 percent of public school students passed, compared to 88.8 percent of non public school students; the numbers for math were 83.1 and 88.7, respectively. The top three districts – those with the highest percentage of students passing both sections – were as follows: Carmel Clay Schools (93 percent), Zionsville Community Schools (92.8 percent), and West Lafayette Community School Corporation (92.1 percent). That means about nine out of every ten students taking the test in those areas passed. Each of those districts is considered among the state’s wealthiest communities. The districts with the lowest percentage of students passing both sections were Gary Community School Corporation (47.7 percent), School City of East Chicago (50.3 percent) and Community Schools of Frankfort (50.3 percent). So, as you can see on the right, five out of every ten students taking the ISTEP+ in those areas passed – and five did not. Gary and East Chicago are both located in Lake County, an area where almost 20 percent of people currently live in poverty. 6) How Did Takeover Schools Perform? The state’s four takeover schools with data included in this year’s IDOE report remained near the bottom as far as passing rates go, but each showed some gains from last year. Howe High School (formerly part of Indianapolis Public Schools) gained eight percentage points, and sits this year at a 37.7 percent passing rate for its middle school students. Seventh and eighth graders at Arlington High School (also formerly IPS) gained 11 points to reach 35.5 percent passing. CSUSA Donnan Middle School (again, a former IPS school) saw its rate go up 0.5 percent to 25.4 percent. Edison Learning Roosevelt High School (in Gary) gained 4.6 points to achieve a 20.3 percent passing rate. Class adjourned…for now. Any questions?